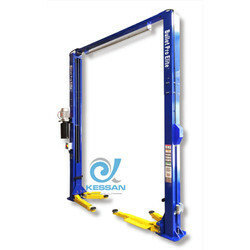 Manufacturer of a wide range of products which include interactive scissor lift, wheel alignment scissor lift, two post lift, two post lift - free floor, four post lift and two post lift - base floor. 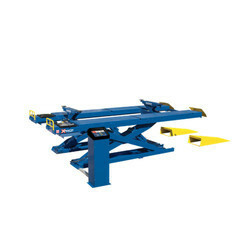 We hold expertise in offering a wide range of Interactive Scissor Lift. These are robustly constructed using best quality components which make these extensively durable and robust. 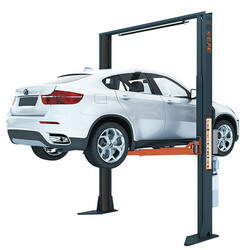 Our lifts are acknowledged for their robustness and high load bearing capacity. These are admired for their effective performance and high built strength. 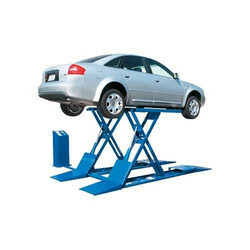 Keeping in mind the precise demands of clients, we offer a wide range of Wheel Alignment Scissor Lift. These are admired for their robustness and high functional efficiency. Demands of these devices are increasing day by day owing to its dimensional accuracy, robustness and longer working life. One can avail these in various range and models. Electrical release, just press Up and Down button to operate the lift. Asymmetric column installation and asymmetric arm configuration for wider door opening. Only 40 seconds raising time with optional quick motor to shorten your service time. Baseless design for easy movement of maintenance equipment under the raised vehicle. Durable cylinders in each column carry with anti-surge valves. Screw-up lifting pads with clearance height less than 110MM. The arm locks engage automatically when the lift is raised and disengage when lowered fully. The rubber protected overhead bar switches off the power system when vehicle roof touches it. Standard aluminum motor avoids over heated and ensures long service life. Standard door protection pads to prevent possible damage when the door opened without caution. Pre-fixed hydraulic pressure prevents overloading operation. ABS control box with rubber gasket sealing. CE certificated by SGS UK. 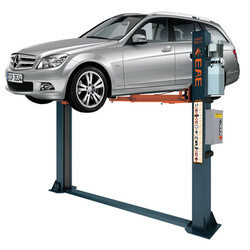 We are involved in offering a qualitative range of Four Post Lift. Owing to its ergonomic design and uninterrupted performance, these lifts are extensively preferred by various numbers of clients. Our devices are available in various models and designs as per the requirements of clients. We ensure consistent performance and longer service life of these lifts. Base design for low ceiling workshops. Only 35 seconds raising time with optional quick motor to shorten your service time. Symmetric four 2- stage telescopic arms combination. Screw-up lifting pads with clearance height less than 100MM. 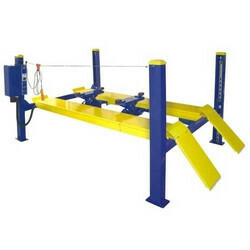 We are engaged in offering a wide range of Single Post Lift. These are engineered using top quality components which ensure its maximum durability, robustness and rough and tough usage. Our devices are admired for their high load bearing capacity, durability and high functional efficiency. Besides, these are acclaimed for their consistent performance and reliability.